One of my favorite things about summer is the fresh veggies! Growing up on a cotton farm in west Texas, most years we had more fresh produce than we knew what to do with. My parents often grew corn, okra, squash, zucchini, cantaloupe, watermelon & black eyed peas perfect for canning. I miss those black eyed peas....nothing you can get in a grocery store shelf can compare. Before we bought a house, having a garden never really crossed my mind. 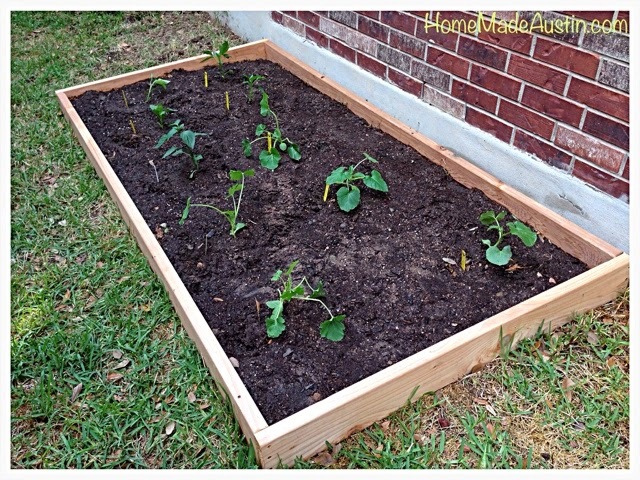 I've heard of growing veggies completely out of containers, but it always seemed like a hassle. And my thumb is no where near green. But, after being in our home for about a year, my husband & I both decided it was time. Time to grow some food. Our backyard is great for spending an afternoon with a book, or grilling but not the ideal spot for plants that need sun. 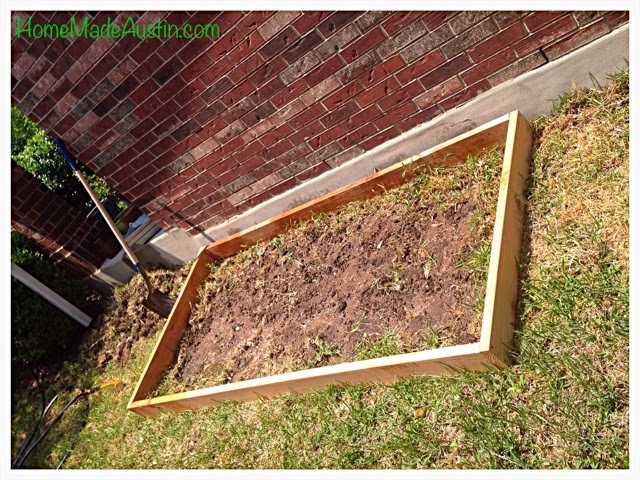 We have a bunch of giant trees that canopy most of our backyard, so we decided to create a small garden box on the side of our front yard, where there would be some shelter from wind & storms, but plenty of good 'ol sunshine. 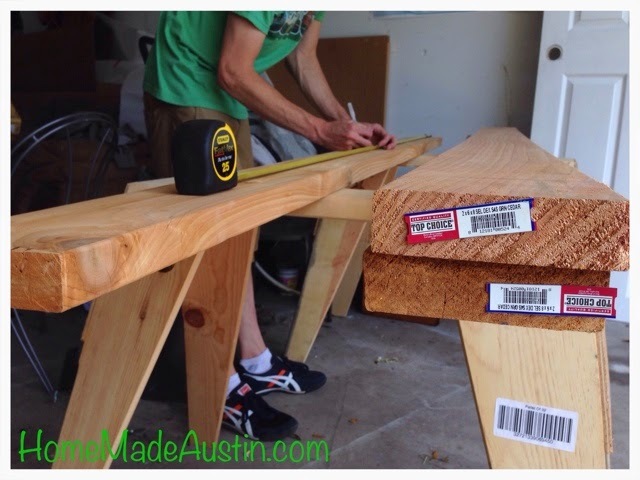 We started with three 2 x 6 pieces of untreated cedar. Then we headed out to The Natural Gardener, a really fun, very 'Austin' gardening haven just outside of Austin. 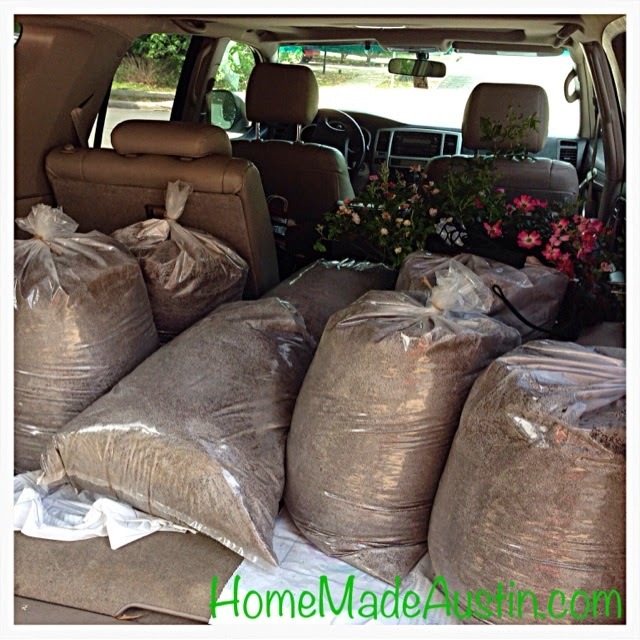 We ended up picking up 6 large bags of Hill Country Garden Soil, which is great for all sorts of plants, especially veggies. We opted to go the easy & less expensive route of 'bagging out own' dirt. And of course, while we were at The Natural Gardener, we picked up several organic starter plants. 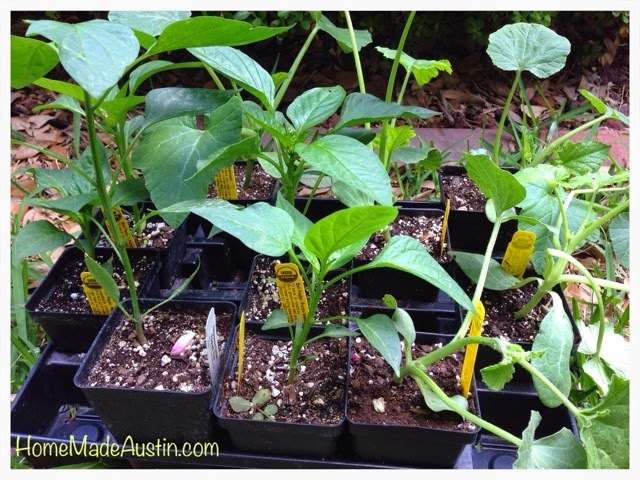 We got yellow squash, zucchini, a variety of colored bell peppers, a mild variety of the Jalapeno & cantaloupe. It should be plenty for our first try & provide us with some of our summer favorites. Andrew started by measuring the half-way mark on one of the pieces of wood & cutting it at that mark. 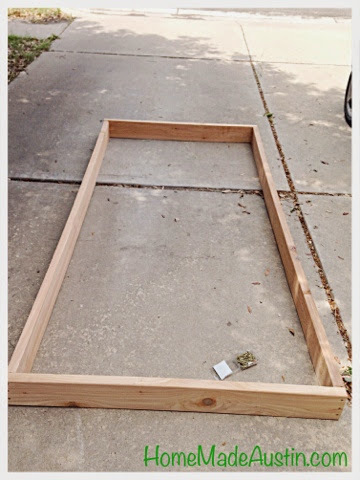 He then screwed all of the (now) four pieces together to create a rectangle. 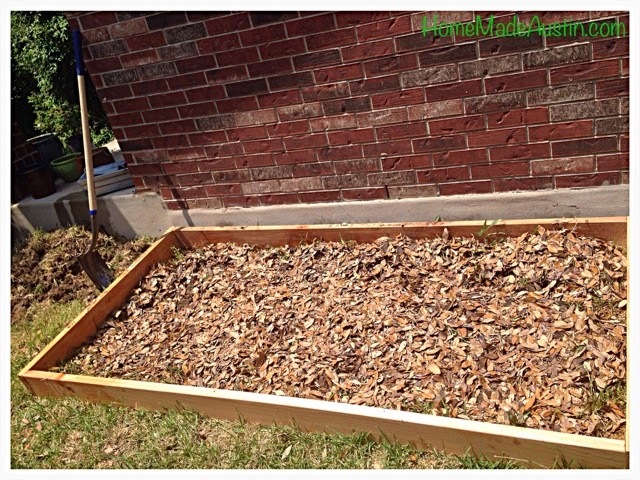 He then placed the rectangle where we wanted the garden to be & started digging up the grass to create fresh dirt. 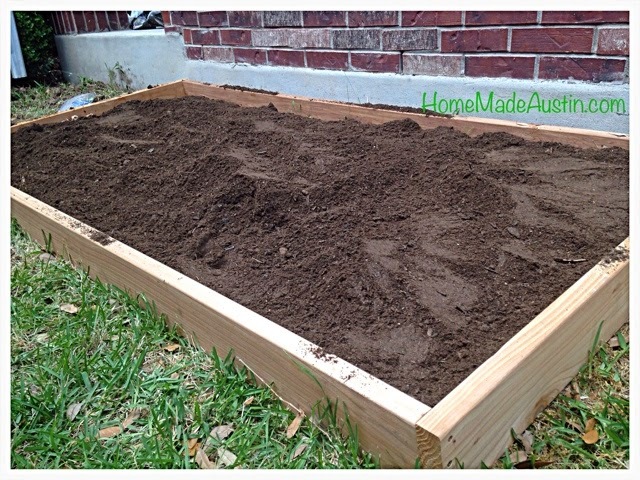 and the soil from the Natural Gardener, being sure to wet everything down between each layer. He created three full layers. After wetting down the surface one more time, we planted everything, keeping the original stakes so we would know what's what. I do plan on creating some cute chalkboard identifiers soon. It's only been a few days since we planted everything, but so far, everything's looking really good & I think the plants are even growing a little taller!